We’re pleased to announce we’ve got a digital marketing entrepreneur consulting for Adzooma! Richard Gregory, current chairman of Ruler Analytics and Ash.tv, Non-Exec Director of Fluid Digital and Co-Founder of SAScon, will be focusing on our business strategy and strategic partnerships. To get to know him a little bit better, we decided to delve a little deeper with an exciting Q&A. You’ve got an impressive background – can you talk us through your previous roles at Latitude and Tech North? In some ways, my career has been a bit of an evolution. I started out at the bottom of the ladder as an Account Exec in a sales promotion company, then moved onto Direct Marketing, then one of the first web design agencies – we’re talking pre-2000 here. That first move into the online world was the gamechanger and ultimately lead me to Latitude, which pioneered the use of PPC in the UK. During my time at Latitude, I’d also partnered with some of my peers to create a digital marketing conference, called SAScon, which become the largest digital conference in the North of England. Then, I was subsequently approached to run Tech North, the sister company of Tech City, with the mission of helping tech founders in the North grow faster. It was a tough, but rewarding role, and exposed me to even more amazing start-ups that were often in hiding. What type of work are you doing with Adzooma / What are your plans for the company? Having operated PPC advertising for SMEs at Latitude, I want to bring some of that experience to the team and mostly focus on routes to market. There is an amazing opportunity to make PPC work harder for time-poor SMEs and the tech platform that Adzooma have developed is well ahead of the competition in my opinion. You influence a lot of entrepreneurs – is there anyone who influences you? Absolutely, I’m a complete sponge and absorb as much insight as I can from great people. Right now I’m really impressed by the work of Bruce Daisley. In addition to his day job as VP of EMEA for Twitter, he’s found the time to research how to create the ideal workplace and turned that into a podcast – Eat, Sleep, Work, Repeat – and book – The Joy of Work. Both are excellent. How did you end up working in Digital Marketing? I moved to London for my first job after University and, despite being a poor graduate, saved vouchers from copies of the FT to buy my first modem. I was hooked the day it arrived. As luck would have it, the Direct Marketing agency I was working for bought a controlling share of a web design agency. My boss knew I was “into that internet thing” so he seconded me to that agency and the rest is history. What have been the most important things you’ve learned throughout your career? An abundance of ideas and an inability to execute on the right things can kill a business. I’m a huge fan of OKRs as a methodology for developing company strategies because it forces you to prioritise on a few big things. What advice would you give to startups looking to grow their business? Very often founders seek validation of their business idea from friends and family. Unsurprisingly, they’ll think your idea is amazing because they don’t want to hurt your feelings. Be sure to run your ideas past someone more impartial. I have a couple of colleagues who will quite happily point out wrong assumptions in my business plans and I’m grateful for the failures they’ve averted. Do you think print advertising will ever completely die out? The advertising landscape is simply becoming more and more fragmented, but that simply reflects how people spend their time. Are there any books you’d recommend budding entrepreneurs read? Or are there any others you read for fun? 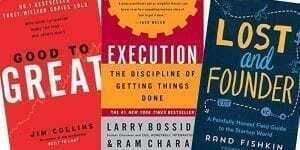 I tend to read quite a lot, but have some solid “must read” books. Good to Great by Jim Collins – evidence-based analysis of what separates great companies from good companies. I particularly like the window and mirror approach that the best leaders adopt.. Go look it up. Execution by Larry Bossidy – There’s plenty of literature about creativity and innovation, but this book focuses on the art of delivery. Lost and Founder by Rand Fishkin – a brutally honest account of the real stresses and turmoil of start-up life. Read this before you start your business….you might change your mind. What’s your favourite business podcast? Bruce Daisley’s Eat, Sleep, Work, Repeat podcast (as mentioned above) is essential listing for anyone in the working world. I love Bruce’s approach to challenging the norms around the working environment, and how he harnesses the rich library of research available to help us make work more fun and productive. Twitter, Linkedin, Facebook… Which one would you choose and why? Twitter for news; LinkedIn for learning and sharing insight; Facebook for friends. What do you think the rest of 2019 has in store for the PPC/marketing world? I started in search marketing back in 2001 and the industry grew and developed at a phenomenal rate for the first decade. After that, I feel things started to slow down but we’re now heading to a new phase of innovation as Machine Learning and AI becomes more accessible. Expect automation to increase exponentially. Thank you Richard. We really appreciate your time and we look forward to seeing what you can bring to Adzooma. We’ll be sure to listen to your favourite podcast! I studied Journalism at Derby University, so I have experience writing about a range of subjects and interviewing people for hours on end. I love anything to do with makeup and beauty and probably spend most of my time either getting ready or watching makeup tutorials. It’s very rare I wear an outfit that isn’t completely black but I think I look weird wearing colour.